It can be hard to practice this way. Tedious. Sometimes we get ahead of ourselves and want to jump right into the fun stuff. Once, years ago, I went to Blues Week at the Augusta Heritage Festival, in West Virginia. I was a decent guitarist, mostly playing finger-picking folk music. I’d been playing for years, and taking lessons locally. I felt ready to stretch my wings a little. So, I saved my money, sent in my registration, and made reservations for red-eye flights and a cheap rental car. Off I finally go to the summer music adventure of a lifetime, to learn fingerstyle blues guitar with Woody Mann, who learned from Reverend Gary Davis himself. How exciting! I fly across the country, and drive for hours, move into my dorm room, and hustle off to our first class together – just 14 of us, all reasonably competent, with nothing better to do all week than learn from a master. This is going to rock! After introductions we get out our guitars, and darned if Woody doesn’t get out a metronome. And set it on slow. S. L. O. W. Tick, tick, tick, tick… Kind of like this, but slower. I was crushed. Really? I came all this way to play along with a metronome? I thought this was supposed to be a pretty advanced workshop, not for beginners who still needed a metronome! Ha. Was I ever wrong! Yes, on the first day we played slowly. We picked apart the details of the tune and examined the fingerings that made the chord changes most efficient. Slowly. But more important, we played correctly. Instead of rushing through the piece, setting poor technique and sloppy errors into stone, we did it right. Slowly. And it actually sounded quite good! The rhythm was correct, the tune had integrity. The beauty of the piece was there, even at this very relaxed speed. And surprisingly it wasn’t boring at all. Paying careful attention to each detail, and really focusing on getting it right was fun and engaging in its own way. Definitely an improvement on blundering through the thing with awkward pauses and sour notes. The next day we worked out a few troublesome bits, and then picked up the pace a little. A little! And the next day faster still. Plus we started the process over with a few more pieces. By the end of the week we were able to play several tunes at a pretty respectable clip. Well. Cleanly. 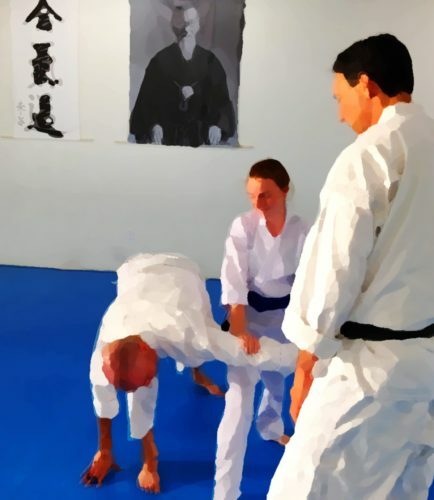 Whatever you are learning, do the kihon waza. We all still need our metronomes from time to time. Practice doing the thing correctly, no matter how slowly you have to go. The speed will come.